Though proportionally small, India's Christians are a populous and significant minority. 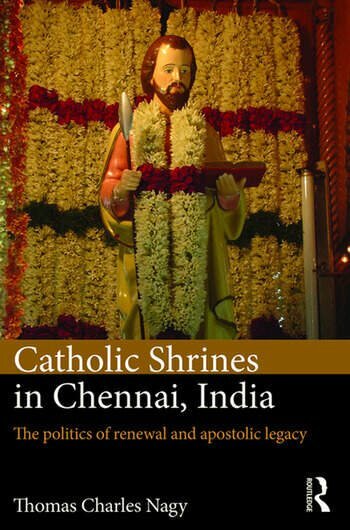 Focussing on various Roman Catholic churches and shrines located in Chennai, a large city in South India where activities concerning saintal revival and shrinal development have taken place in the recent past, this book investigates the phenomenon of Catholic renewal in India. The author tracks the changing local significance of St. Thomas the Apostle, who according to local legend, was martyred and buried in Chennai and details the efforts of the Church hierarchy in Chennai to bring about a revival of devotion to St. Thomas. Insodoing, the book considers Indian Catholic identity, Indian Christian indigeneity and Hindu nationalism, as well as the marketing of St. Thomas and Catholicism within South India. Thomas Charles Nagy is currently a research associate in the religious studies program at Victoria University of Wellington, New Zealand. He received a BA in religion from Whitman College in Walla Walla, WA, his MA in comparative religion from Miami University of Ohio, and his PhD in religious studies from Victoria University of Wellington. His research interests include Indian Christianity with a focus on Catholicism, global Christian studies, the veneration of relics, religious marketing and tourism, and wayang puppetry.